In the late morning of Friday, June 16, 1989, "Cadillac Frank" Salemme, a rising star in the Patriarca Crime Family, was walking through a House of Pancakes parking lot off Route 1 in the Boston suburb of Saugus, Massachusetts, when two gunmen opened fire on him from a passing automobile. Salemme scrambled for cover and rushed inside a Papa Gino's pizza shop about thirty yards away. As he did so, the gunmen's car turned and made a second pass, firing more shots at the fleeing Mafioso. "Cadillac Frank," wounded and bleeding, ran to the rear of the pizza shop, yelled out, "Call the police!" and collapsed near the door to the men's room. He regained his composure and his footing. Returning to the front of the shop, he sat down at the first table. He had been struck twice by the slugs fired at him - once in his chest and once in his left leg. As he waited for police and paramedics to arrive, he calmly pressed his windbreaker jacket against the chest wound to slow the flow of blood. The authorities found the gunshot victim uncooperative. He refused even to identify himself. 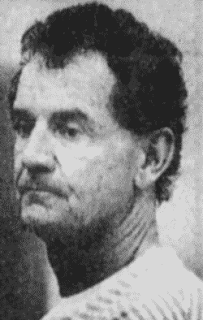 When asked who shot him, Salemme answered, "No one." Salemme was taken to AtlantiCare Hospital in Lynn, Massachusetts. Later in the day, doctors graded his condition as "guarded but stable." Investigators knew of Salemme's connections to organized crime, but they weren't sure what to make of the murder attempt. 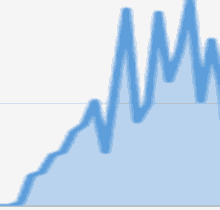 Things became somewhat clearer that afternoon. Shortly after three o'clock, two fishermen discovered a dead body partly submerged in the Connecticut River at Wethersfield, just south of Hartford, Connecticut. Police arriving at the scene found that the male corpse was fully clothed and still in possession of a wallet. Cards inside the wallet belonged to William P. "Wild Guy" Grasso of New Haven. 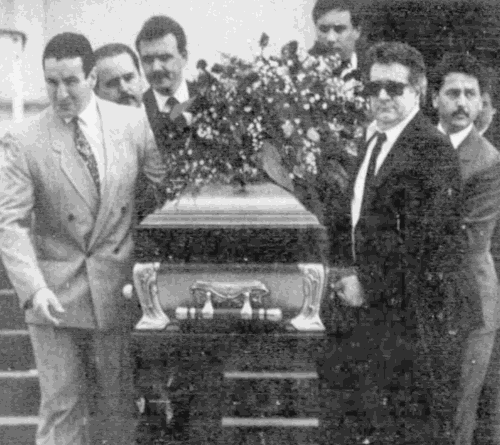 Further investigation positively identified the dead man as Grasso, considered the number-two man in the Patriarca organization, behind only Rhode Island-based boss Raymond "Junior" Patriarca in importance. An autopsy revealed that Grasso had been killed by a single gunshot to the base of his skull. The medical examiner concluded that the gunshot had been fired at least twenty-four hours before the body was found. 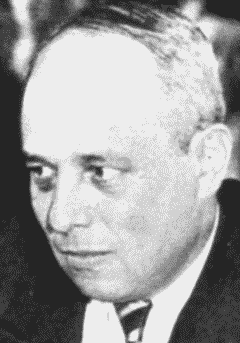 When the news of Grasso's murder was released, Connecticut's United States Attorney Stanley A. Twardy, Jr., noted that the "Wild Guy" was "the single most influential organized crime figure in Connecticut." Twardy also commented that he could not rule out a connection between the murder of Grasso and the attack on Salemme. Detectives kept watch for familiar underworld figures at Grasso's funeral on Tuesday, June 20. Hundreds of people filled St. Michael's Roman Catholic Church in New Haven for a Mass of Christian Burial, but no known Mafiosi were seen. The funeral cortege included fifty cars. Grasso was buried at All Saints Cemetery in his hometown, sharing a grave with his wife, who died a year earlier. He was survived by a son, three brothers and two sisters. Grasso, a New Haven native and once a member of the New York-based Colombo Crime Family, became a member of the New England organization after serving time in Atlanta Federal Penitentiary for creating a garbage hauling monopoly in southern Connecticut. 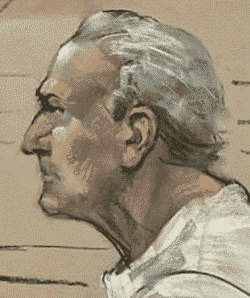 His cellmate at Atlanta was "Junior" Patriarca's father, notorious New England crime boss Raymond L.S. Patriarca. Grasso emerged from prison as a trusted aide of the elder Patriarca. Grasso later referred to his Atlanta sentence as the "best thing that ever happened to me." When Raymond L.S. 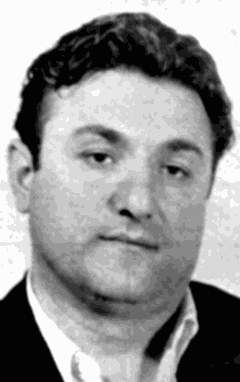 Patriarca died in 1984, "Junior" Patriarca became boss and Grasso became underboss, directly overseeing New England Crime Family rackets in Connecticut. Grasso aggressively expanded his territory from New Haven, across the southern portion of the state into Fairfield County, up into Hartford and beyond into the Springfield, Massachusetts, area, stepping on many mobsters' toes along the way. 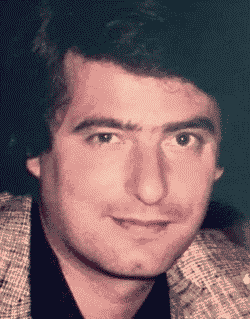 New York Mafiosi had long dominated in Fairfield County, several crime families had interests in Hartford, and Springfield was known to be the territory of a faction of the powerful New York-based Genovese clan. Authorities quickly understood that the moves against Grasso and Salemme were designed to weaken the administration of "Junior" Patriarca. But it took some time before they could piece together just what was going on. The loss of Grasso was keenly felt within the New England Mafia. No one within Connecticut's branch of the organization had Grasso's combination of ability and loyalty. According to FBI sources, the Patriarca administration appointed a Rhode Islander, Matthew L. Guglielmetti, to oversee rackets in the Nutmeg State. Nicholas L. Bianco, another Rhode Island resident, was elevated to the position of underboss. 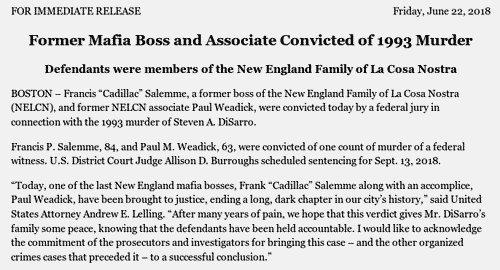 In 1990, federal prosecutors began dismantling the New England Mafia through successful prosecutions. In the process, they learned that brothers Louis and Frank Pugliano, Gaetano Milano and Milano's longtime friend Frank Colantoni, Jr., participated in the killing of Grasso. Believing that Grasso was planning to murder them, they set to the job of eliminating him first. They set up a phony underworld meeting in Massachusetts on June 13, 1989. With Louis Pugliano at the wheel of a van, they picked up Grasso to take him to the meeting. While driving along Interstate-91 in Connecticut, Milano fired a single shot into the back of Grasso's neck. The group deposited Grasso's body at the Connecticut River. At his sentencing in 1991, Milano told U.S. District Judge Alan H. Nevas that he felt the killing of Grasso was necessary: "It was kill or be killed." A like-minded group in Massachusetts was found to be behind the attempt on Salemme's life. Authorities learned that Enrico Ponzo and Vincent Michael Marino were the gunmen who attacked "Cadillac Frank." U.S. prosecutors assembled convincing cases against the New England Mafia rebels (Ponzo was able to avoid capture until early in 2011) and much of the crime family leadership. But an important part of the story remained unknown to them and to the American public. It was unknown because agents of the FBI were keeping it secret. Years later, it was learned that some in the FBI had worked with informants within the New England underworld to create a destructive rivalry within the Patriarca Mafia organization. Seeds planted by the FBI convinced groups within the Connecticut and Massachusetts branches of the organization that the Patriarca administration was planning to eliminate them. That prompted them to act against Grasso and Salemme, and it also figured in several other murders. Defense attorney Anthony Cardinale revealed in a 1997 affidavit that intentional FBI activities caused the plots against Grasso and Salemme and that the FBI knew of the plots but kept silent about them for a period of sixteen months. FBI improprieties were documented in the following years. 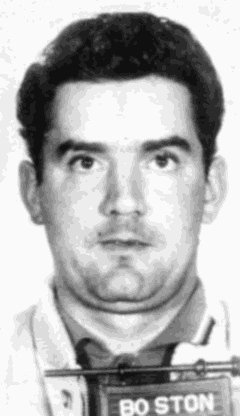 One of the mobsters involved in the FBI efforts was Angelo "Sonny" Mercurio. The FBI actively hid Mercurio's involvement in instigating the anti-Grasso plot while others were tried and convicted for it. Mercurio was never charged in connection with the killing. He died in Florida in late 2006 while in the witness protection program. The revelations of FBI involvement and coverup led to revised sentences for a number of those convicted in the early 1990s. "Garbageman backs attempt to regain 'stolen' customer," Bridgeport CT Post, Nov. 7, 1968, p. 20. "Police confirm reputed crime boss a homicide victim," Associated Press, June 17, 1989, apnews.com. Cullen, Kevin, "Two men linked to mob shot in separate attacks," Boston Globe, June 17, 1989, bostonglobe.com. Hays, Constance L., "A mob leader in New England is believed slain," New York Times, June 17, 1989. Foderaro, Lisa W., "Mob leader's slaying may signal power struggle," New York Times, June 18, 1989, p. 31. Mahony, Edmund, "Hundreds attend rite for Grasso," Hartford Courant, June 21, 1989, p. 1. Gombossy, George, "Magistrate may free mob suspects on bond," Hartford Courant, March 31, 1990, p. C1. Mahony, Edmund, "Two plead guilty to racketeering charges in surprise move," Hartford Courant, May 2, 1991, p. C1. Barry, Stephanie, "Mob killer may get out early," Springfield MA Republican, Sept. 22, 2008, masslive.com. Christoffersen, John, "Judge reduces mobster killer's sentence," Norwalk CT Hour, Oct. 9, 2008. Marcus, Jon, "Attorney says FBI encouraged mob shootings," New Bedford MA SouthCoast Today, Jan. 10, 2011, southcoasttoday.com. Guilfoil, John M., "Fugitive mobster found in Idaho," Boston Globe, Feb. 9, 2011, boston.com. Mahony, Edmund H., "The Mob in Connecticut: Grasso's reign of terror," Hartford Courant, April 26, 2014, courant.com. is scheduled for release in the fall of 2018. 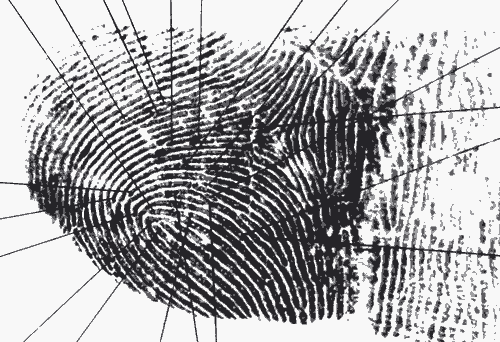 Information for crime history writers, advertisers and readers is available on the Informer website. James Lumia, businessman, gambling rackets boss and Tampa Mafia leader, was in his car, double-parked on 19th Street near Harper Street(*) in the Palmetto Beach neighborhood south of Ybor City. The headquarters of his gasoline and oil distributing company was close by. It was about 10 o'clock Monday morning, June 5, 1950, and he had stopped to give some instructions to employees Fernando Gil and Gaspar Montes, parked in a Chevrolet pickup used for oil company maintenance work. As he spoke to the men through the passenger side window of his new, green, Chrysler sedan, a blue Ford pulled alongside and slightly in front of him. The driver of the Ford tapped his horn, causing Lumia to turn to his left and look out his window. A man rose from the Ford's back seat and fired a shotgun into Lumia's face. 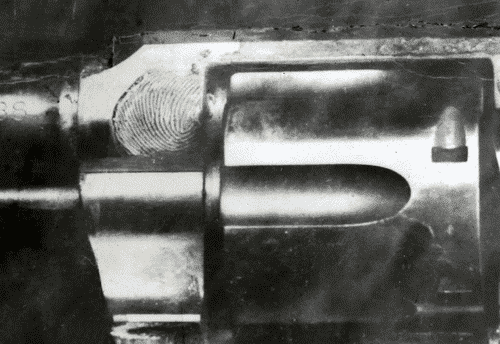 The buckshot blast tore off the top front of Lumia's head, leaving a five-inch wound that stretched from "an inch or so below his eyes to some distance above the hair line." Blood, flesh and brain tissue were splattered about the inside of the vehicle. The gunman's car then drove off. In a futile effort to save his boss, Gil climbed into the driver's side of Lumia's car, pushing Lumia just enough to the right to allow him space on the seat, and raced off toward the hospital. Montes got the attention of off-duty Hillsborough County, Florida, Deputy Sheriff George Penegar, who was driving by, and told him to follow the gunman. The speeding Chrysler caught Penegar's eye, and the deputy sheriff pursued it rather than the Ford. He stopped Gil at the busy intersection of 19th Street and Adamo Drive. Penegar seized a pistol found in the vehicle and called for an ambulance. It took Lumia's forty-seven-year-old body nearly a half hour from the time of the shooting to acknowledge what was obvious to everyone else: Lumia was dead. His breathing reportedly continued for about fifteen minutes after he reached the hospital. 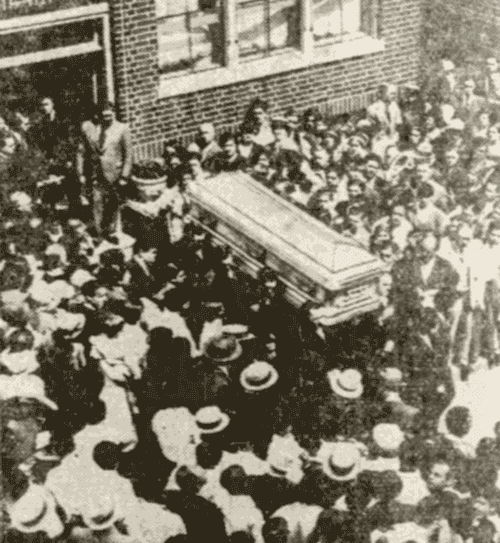 Lumia's funeral was held on Wednesday afternoon, June 7. He was entombed in the family mausoleum at L'Unione Italiana Cemetery. Traffic is directed around the Lumia automobile. Police investigators were quickly frustrated. Gil and Montes said they could not recall any helpful details about the gunman's car or its occupants. Their instincts for self-preservation may have clouded their memories. 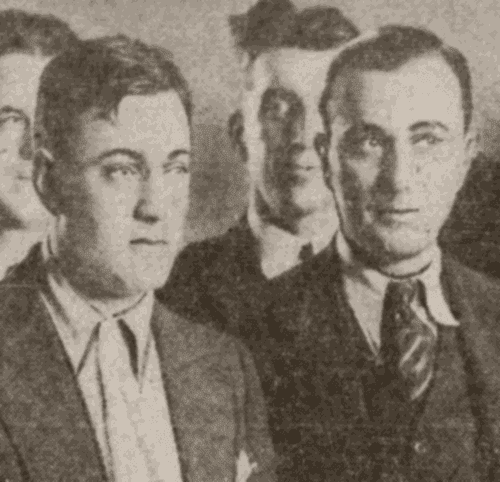 There was reason to believe that the brothers of crime figure Jimmy Velasco, shot to death in 1948, had set up the killing of Lumia to avenge Jimmy. 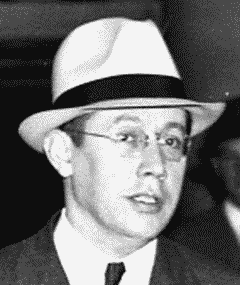 When Jimmy Velasco's accused killer, Joseph Provenzano, was brought to trial in 1949 (he was acquitted), Velasco's widow testified that Lumia was a leader of a regional gambling syndicate and an enemy of her husband. Detectives questioned Roy and Arthur Velasco about the shooting of Lumia. Though neither was at all upset at learning of Lumia's demise, each provided alibis. The possibility that Lumia had a falling out with underworld figure Salvatore "Red" Italiano could not be pursued, as Italiano was known to be away in Italy, arranging wine deals for his Tampa business. Lumia's name had been mentioned in the press recently in connection with the trial of several - including Roy and Arthur Velasco - who were accused of plotting to kill Hillsborough County Sheriff Hugh Culbreath. Defense attorneys suggested that the plot against Culbreath was fabricated by Lumia, Italiano and Primo Lazzara, working with Culbreath, in order to halt the Velasco brothers' investigation into Jimmy Velasco's murder. The defense wanted to call Lumia, Italiano and Lazzara as witnesses, but they could not be located. The trial was paused on May 11 at the request of the defense. At the time Lumia was murdered, he was scheduled to appear as a witness when the trial resumed in mid-June. 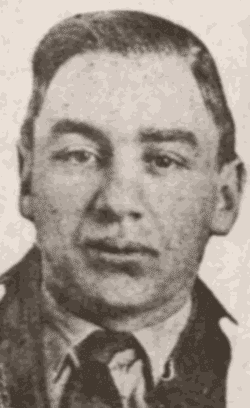 Lumia was known to be well connected politically and was found to have close acquaintances in the Mafia across the U.S. Within the Tampa area, Lumia had kinship ties to the Diecidue and Antinori clans. It was later revealed that the godfather of Lumia's son was Pittsburgh Mafia leader John LaRocca and that LaRocca attended the wedding of Lumia's daughter. (Pittsburgh area Mafia leader Gabriel Kelly Mannarino later served as godfather to a Lumia grandchild.) 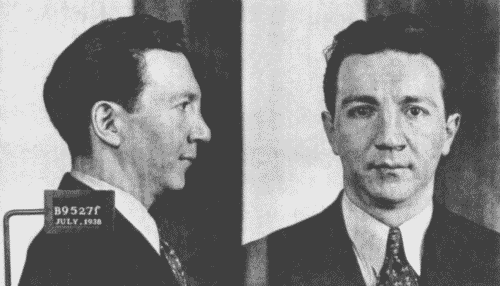 Upon the arrest of southern California crime boss Jack Dragna, Lumia's telephone number was found to be in Dragna's possession. The interior of Lumia's Chrysler is examined. Local police Chief J.L. Eddings told the press of rumors that Lumia worked in the background of the regional gambling syndicate. He noted, however, that Lumia had never been arrested. A week and a half after the Lumia murder, with the investigation going nowhere, Chief Eddings announced his resignation. 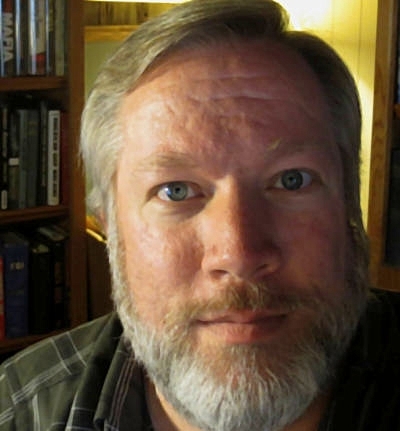 The fifty-year-old Eddings indicated that his doctor required him to take a long rest. In the same period, Hillsborough County Sheriff Culbreath and State's Attorney J. Rex Farrior were criticized for underworld links and failure to resolve a series of gangland killings. Lumia was discussed when the U.S. Senate's Kefauver Committee investigated the impact of interstate rackets on Florida. One witness brought before the committee, the ex-wife of Deputy Sheriff DiLorenzo, said her ex-husband appeared to know about the Lumia murder before it occurred. She said Anthony DiLorenzo was familiar with Santo Trafficante and Primo Lazzara and served as a messenger between law enforcement and organized crime. The deputy sheriff indicated beforehand that he had some role to perform in connection with the Lumia murder. He told his wife that he wished he could get out of it, but "he was in it so deep that he couldn't get out." DiLorenzo allegedly told his wife years earlier that Lumia was "getting too big and someone had to stop him." (*) These Tampa streets, 19th and Harper, no longer intersect. Images from June 6, 1950, issue of Tampa Tribune. "Investigation of Organized Crime in Interstate Commerce," Hearings Before a Special Committee to Investigate Organized Crime in Interstate Commerce, U.S. Senate, 81st Congress, 2d Session, and 82nd Congress, 1st Session, Part 1-A Florida, Washington D.C.: U.S. Government Printing Office, 1951, p. 39-44. "Investigation of Organized Crime in Interstate Commerce," Hearings Before a Special Committee to Investigate Organized Crime in Interstate Commerce, U.S. Senate, 81st Congress, 2d Session, and 82nd Congress, 1st Session, Part 1-A Florida, Washington D.C.: U.S. Government Printing Office, 1951, p. 49. Forsyth, Thomas G. III, "Gabriel Mannarino," FBI report, file no. 92-2914-351, NARA no. 124-10277-10007, June 26, 1969, p. 2. Voege, Robert A., "Sebastian John La Rocca," FBI report, file no. 92-2940-33, NARA no. 124-90104-10151, July 9, 1958, p. 11-12. "Golden wedding today," Tampa Tribune, Aug. 12, 1945, p. 29. "Funeral notices," Tampa Tribune, April 25, 1947, p. 2. "Defendants accuse sheriff of frame-up," Palm Beach FL Post, May 12, 1950, p. 11. "Rodrigez charges 'frameup,'" Tampa Tribune, May 12, 1950, p. 1. "Tampa murder plot suspects charge sheriff with frame-up," Tampa Tribune, May 12, 1950, p. 12. "Tampa gambler murdered," Orlando FL Evening Star, June 5, 1950, p. 1. "Lumia killed; described as gambling boss," Binghamton NY Press, June 5, 1950, p. 14. "Gambler slain in gang-style," Franklin PA News-Herald, June 5, 1950, p. 1. "Funeral notices," Tampa Tribune, June 6, 1950, p. 2. Murray, J.A., "Two men in blue car...," Tampa Tribune, June 6, 1950, p. 1. "Warren silent on slaying of Luma; warning recalled," Tampa Tribune, June 6, 1950, p. 1. Abbott, Bill, "Lumia's slaying 15th spewed on Tampa by flaming gang guns," Tampa Tribune, June 6, 1950, p. 1. "None of 15 gambling slayings here ever solved," Tampa Tribune, June 6, 1950, p. 6. "Fla. gambler is killed by gun blast," Shreveport LA Times, June 6, 1950, p. 15. "Lumia murder may again baffle Tampa police force," Orlando FL Evening Star, June 6, 1950, p. 11. "Tampa gang style killing puzzles police," Fort Lauderdale FL News, June 6, 1950, p. 13. "Slaying of Lumia baffling to police," Tallahassee FL Democrat, June 6, 1950, p. 1. "Tampa gaming czar is slain," Palm Beach FL Post, June 6, 1950, p. 1. "Tampa chief of police resigns," New York Times, June 16, 1950, p. 20. "Crime probe of Miami underway," [Salem OR] Daily Capital Journal, Dec. 29, 1950, p. 2. "Text of Rex Farrior's sworn statement to senators is released," Tampa Times, Feb. 22, 1951, p. 1.